We all know the famous saying that says you are supposed to include something old, something new, something borrowed and something blue in your wedding for good luck. Most of these are probably easy to do; new dress, grandma’s wedding ring, and big sister’s veil… But when it comes to finding something blue, this can be more challenging. If you’re stuck on how to uphold this timeless tradition read through our 5 ways to add something blue to your upcoming nuptials. Dress your bridesmaids in beautiful floor sweeping gowns in a pretty blue hue. The empire waistband and slimming pleats flatter any silhouette. A lightweight scarf in pale blue will look elegant draped over your arms during the ceremony or in the evening. The lightweight accessory will add a splash of colour to your ensemble. A pair of feminine, strappy heels is a subtle and chic way to add blue to your wedding. Have your groom wear a tailored fit suit in royal blue. It is made with mechanical stretch so he will look great and feel comfortable all day. 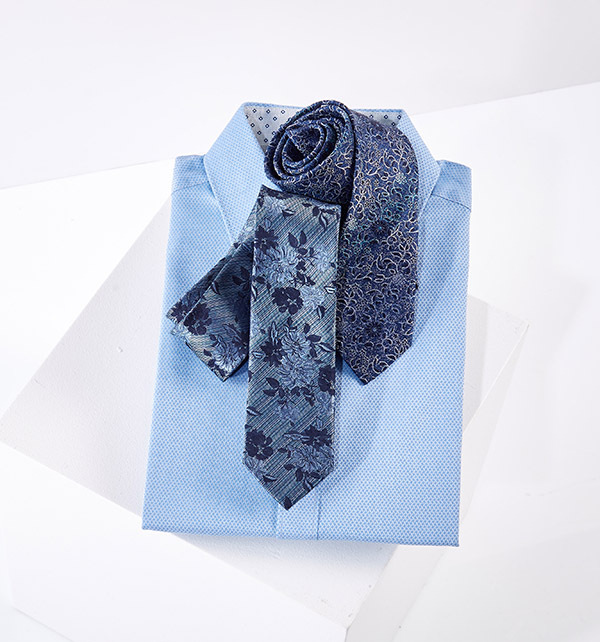 A tie is a great way to add a bit of colour to men’s attire, so have your groom wear a brocade tie designed in an eye-catching blue floral pattern. For more wedding day style, shop all our new arrivals in the Wedding Boutique here.